My son hates blowing up balloons [thanks to a balloon that blew up on his face once]. So this self inflating balloon science experiment is one he likes. It’s very easy to do too. 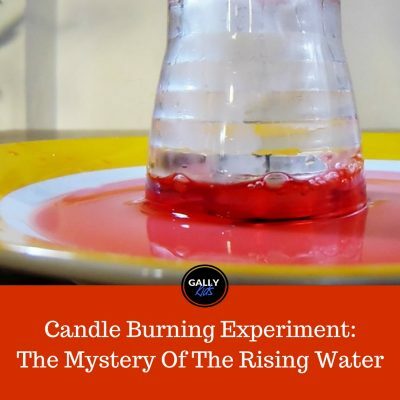 And if your child is looking for a science project to do this year, you might want to have a look at this experiment. 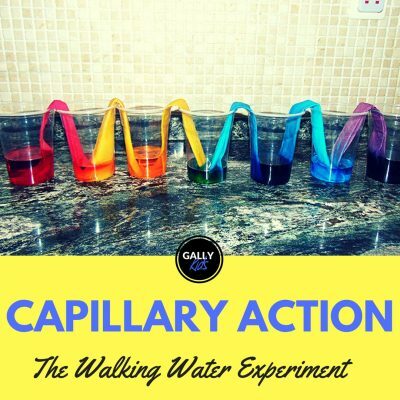 We did this experiment one Saturday afternoon when my son was just getting a little bit tired of all the educational experiments and activities we were doing (something I had planned for a series of videos on our Gally Kids Youtube channel). So yeah. 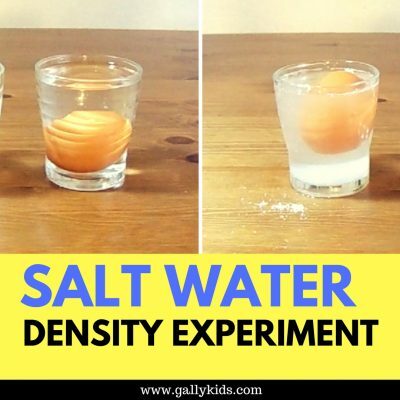 If you have a child who has done an experiment with vinegar and baking soda (or have one of the preschooler Chemistry science kits – which usually has this experiment included) you’ll probably get exactly the same reaction. But we are testing a different thing in this self inflating balloon experiment. We’re showing the “explosion”. Instead, we’re showing them that a new gas is formed when these two things react with each other. The baking soda went in first. Well, to be honest, I did the vinegar first- which is a huuuge mistake! 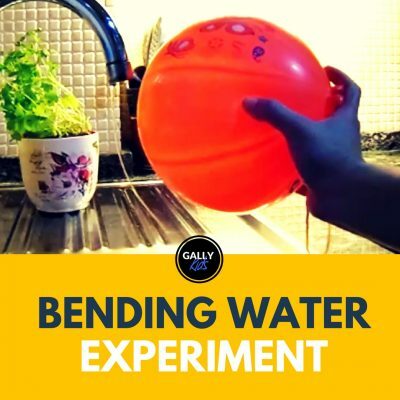 This meant that the funnel got wet and the baking soda wouldn’t get stuck to the funnel instead of flowing straight into the balloon. After the baking soda, put the vinegar in the glass bottle. Now a side note to the bottle. We used a small bottle here. And I suggest you do the same for a bigger and more spectacular balloon size. Now comes the tricky part. 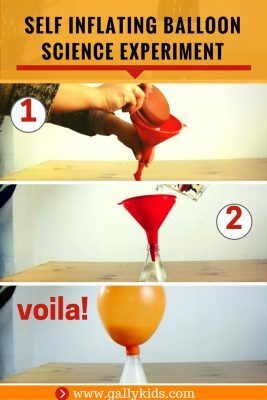 This is when you put the balloon on the opening of the glass bottle. Young kids might need help with doing this properly. Make sure that it’s tight and secure, all else, the pressure will cause the balloon to dislodge and all that air will escape. 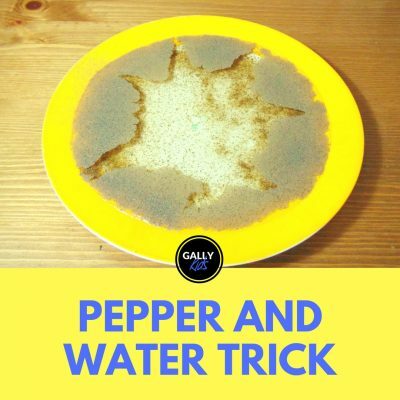 Also when doing this, don’t let the baking soda fall into the vinegar yet. And finally, it’s time to pour all that baking soda in. As soon as they touch each other, a chemical reaction takes place. Bubbling starts and the balloon starts to inflate. I was surprised at how big the balloon inflated. 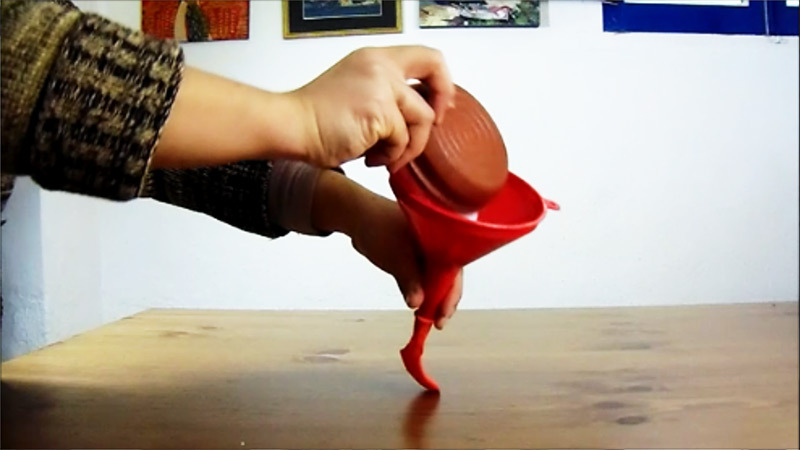 First, using the funnel, pour all the baking soda in the balloon. 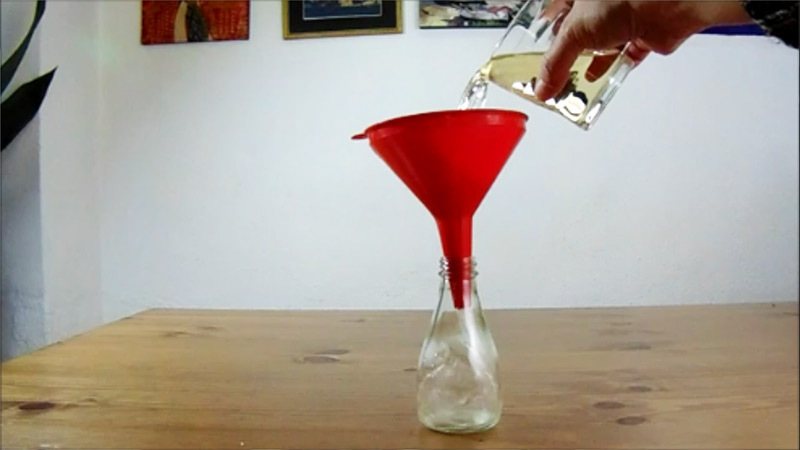 Then put the balloon aside and pour the vinegar into the small bottle using the same funnel. 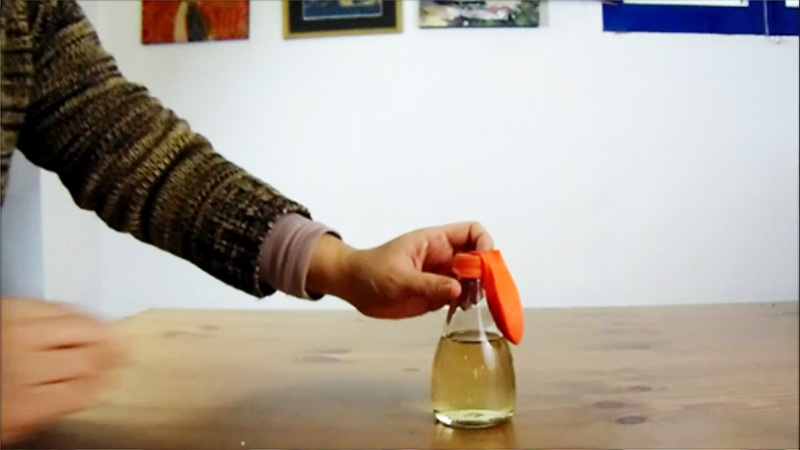 Next, carefully fit the balloon into the bottle opening. Make sure the baking soda doesn’t fall in while you’re doing this. And most importantly, make sure the balloon is tight and secure. When baking soda and vinegar mix, a chemical reaction takes place. This chemical reaction produces carbon dioxide which you can “see” from all the bubbles. Now all this extra air has nowhere to go except towards the balloon. 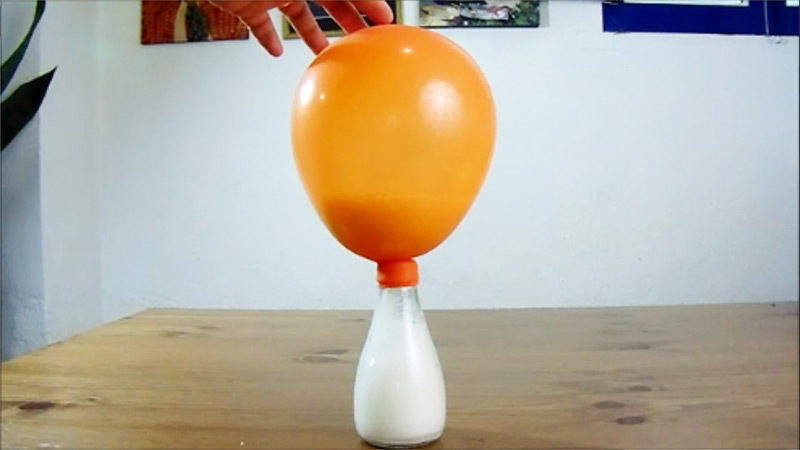 And as the heavier carbon dioxide pushes the air, it inflates the balloon. 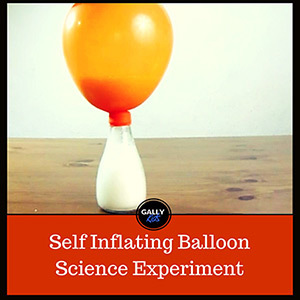 The size of the inflated balloon will depend on many variables such as the size of the bottle and the vinegar and baking soda ratio. 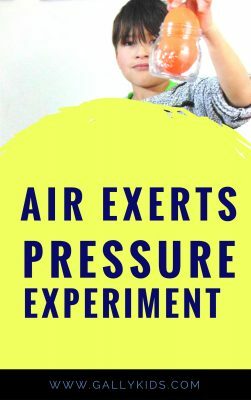 Make sure the balloon is tight and secure on the bottle opening or else it might slip off as soon as the reaction takes place releasing the carbon dioxide into the air.